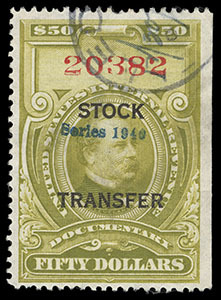 Stock Transfer, 1940, $50 olive green, natural s.e. at right, well centered, brilliant color, neat circular handstamp cancel, fresh and Very Fine. 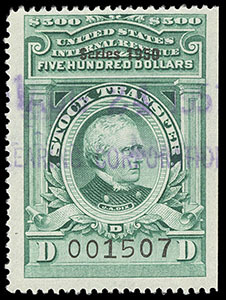 Stock Transfer, 1941, $50 bright green, blue straight line date stamp cancel, rich bright color, choice centering, Extremely Fine, rarely encountered so choice; with 2002 P.S.E. certificate. 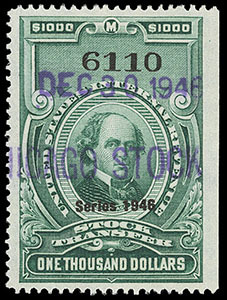 Stock Transfer, 1946, $1,000 bright green, purple straight line date stamp, rich bright color, Extremely Fine; with 2002 P.S.E. certificate. 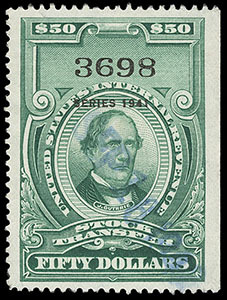 Stock Transfer, 1949, $500 bright green, purple straight line date stamp, vibrant color, choice centering, Extremely Fine; with 2002 P.S.E. certificate. 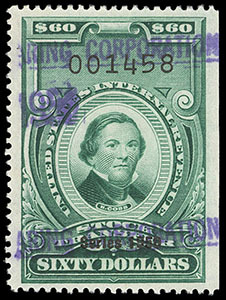 Stock Transfer, 1950, $60 bright green, purple straight line date stamp, deep rich color, exceptional centering, Extremely Fine, a choice Stock Transfer issue; with 2002 P.S.E. certificate. 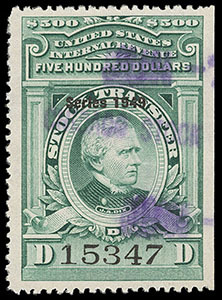 Stock Transfer, 1950, $500 bright green, purple straight line date stamp, bold color, attractively centered, Very Fine; with 2002 P.S.E. certificate. 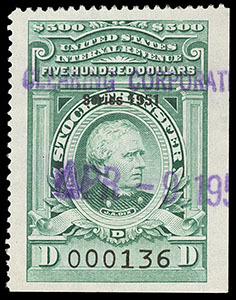 Stock Transfer, 1951, $500 bright green, purple straight line date stamp, strong bright color, well centered amid wide margins, Very Fine and choice; with 2002 P.S.E. certificate. 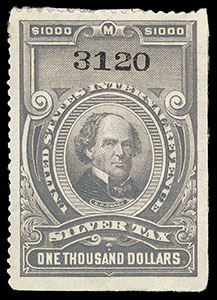 Silver Tax, 1944, $1,000 gray, faint magenta handstamp cancel, choice centering, some paper adherence on reverse, Very Fine and choice; with 2009 P.F. certificate. Hetherington, J.E., 2¢ black, watermarked USIR, o.g., hinge remnants, attractively centered, strong bold color, Extremely Fine, a lovely sound example of this very scarce stamp, only 36 are recorded in the Aldrich census (of which 14 are reported to be faulty). ; with 2012 P.F. certificate. Jayne & Son, 4¢ Green, Imperf, Watermarked USIR, without gum, large margins, deep bold color, Extremely Fine, scarce with 52 examples recorded in the Aldrich census (35 of which are reported to be faulty); with 2004 P.S.E. certificate.